This rocking chair is super heavy duty. It’s really strong & stable. My aluminum porch furniture blows over in the wind & this rocker stays put. It’s got a lovely hammered copper looking finish but is made of steel. I highly recommend this outdoor piece of furnature. Enjoy your peaceful days and nights outdoors with the new Sun Ray porch rocker from International Caravan Home Furnishings. Made with weather-resistant hammered bronze iron, this patio rocking chair features a bronze finish that blends flawlessly into most deck or patio decors. Comfortably spend your evenings resting against the high back and wide seat, which is perfect for cozy cushions. 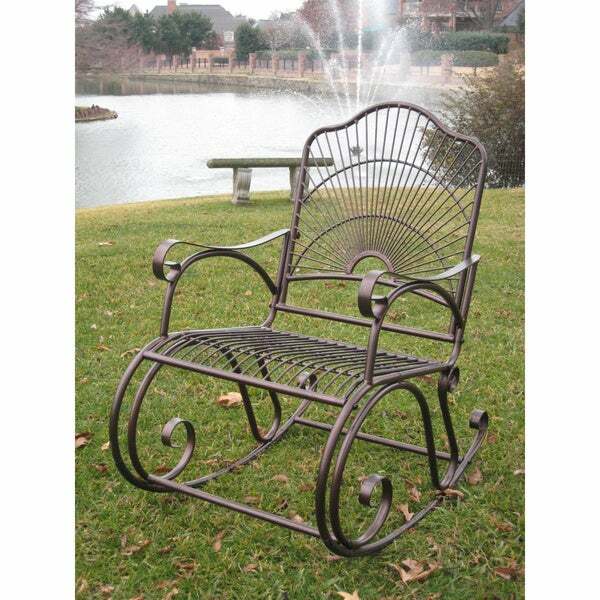 Rock away your worries while taking in the beauties of the great outdoors in this sturdy rocker constructed of wear-resistant iron with an open design. A rust-resistant double powder-coated outer finish that enhances the graceful scrollwork frame with rolled arms ensures years of durability and beauty. The high back, wide seat and smooth rocking motion ensure a comfortable seating option for your patio or veranda. Dimensions 5.0 In. X 36.0 In. X 40.0 In. The rocker is a lovely accent piece on my front door landing. OK in terms of comfort. It's a little hard on the back so I wouldn't recommend it for someone who is buying it and plans to spend their leisure time rocking away while sipping iced tea and reading a book, but, we mostly bought it for its eye appeal - which it definitely has. Looks great with the big pot of geraniums next to it. We repainted our chair a flat gray green because we didn't like the color. Very shiny brown (trying to be copper). But, it couldn't have been simpler to do. And it took only minutes (without allowing for the drying between coats - it took two). Chair was delivered very quickly and was easy to assemble except for one bolt hole, which was not drilled properly. After struggling and banging, we decided to drill a bigger hole. Glad we did because the chair was exactly what we wanted. It looks the same as in the picture. A worthwhile purchase. Loved the rockers design, the tube construction makes it strong. When we recieved the rocker holes were off 1/2 inch. As a mechanical designer , I was disappointed in the quality control of the product. At the companies I have worked for, this item would have been rejected. We had to redrill which weakened the tube (to get it to fit). This also removed the finish at the 2 spots, I will have to watch these spots for deteriation. The finish on the rockers had some runs on it. I wanted to buy the rest of the set, but I glad I desided to buy in 2 purchases. I think I will pass on the set. This is an excellent outdoor rocker. Low/no maintenance required, and withstands all outdoor weather. Very well-built. Not too difficult to construct. And beautiful design. Very pleased with my purchase. So much so that I've given a set as a gift! I bought this a couple of years ago and it still looks beautiful on my front porch! Love the sun ray design and the big circular rockers. Has a large seat where I can share with my granddaughter when we rock together. Beautiful! I ordered two of these rockers, even though there were several reviews indicating that there were some difficulties putting them together. I found the assembly of these to be quite easy, and since additional parts were provided, that added to the ease of assembly (there was one bolt which wouldn't accommodate the Allen wrench in its hexagonal holed-head, and with the extra hardware, this was easily remedied...simply use another bolt). I was able to complete assembly of both rockers inside an hours time. The shade of bronzing is just right to complement the patina on my brass fire pit, and they are heavy and durable enough to go outside and stay for a bit, but light enough to bring inside when I want. The seating surface would be improved with a cushion, and I plan to buy those soon, but the rockers, for form and function are quite perfect. I especially appreciate that the metal rockers are lined with a rubbery material to prevent the scratching of the finish on the rockers, and to prevent the grinding of metal on concrete on a patio. As well, I was quite impressed with Overstock.coms shipping of these items, as delivery within 4 days of the order was most impressive, enabling me to have these prior to a get-together at my house on the weekend. They are lovely! I purchase two of these rockers and the side table for my front porch. The quality is excellent, the powdered coated steel frame is strong and the paint finish is even and there were no scratches on any of the pieces. The assembly time on the first one was 20 minutes, second one 15, the table, less than ten minutes. I highly recommend this product and would buy more if I had any more open spaces! A beautiful finish to my Villa. I am a very fussy shopper & was very pleased with this unique design for a rocker. It was very easy to assemble - no problems at all with the fittings. The finish is a rich dark bronze - very nice. It's not too large but has plenty of seat room. I'll get a seat cushion & throw pillow to make it soft & cozy for reading on our back porch. Great purchase! We are delighted with this patio rocking chair....great value...very nice and fun design. Overstock.com once again,,,y'all are awesome with your products, service, delivery and prices. The rocking chair looks fabulous...it's not the most comfortable rocking chair for your back if you will be sitting for long periods....but it's just right for our purpose and is comfortable enough. If I want to sit for long periods, I would just put a small pillow temporarily on the back. It was easy and quick for my husband to assemble...we are both very happy with this unique stylish not too big rocker. THANKS! Beautiful and comfortable, what more could you want! And easy to assemble! Nice quality, looks like it will hold up well in weather, rubber gliders on bottom makes for smooth rocking. Very happy with this rocker! Great Rockers for my new home. Quality product fits the Decor. for my New Orleans designed home. We bought two of these chairs and the matching side table for out front. Had them all assembled within an hour. Due to reading previous reviews, we were prepared with the drill handy. Only one bolt hole was out of alignment, so we drilled it out a bit. The chairs are comfortable as is and we love the design and color. They feel sturdy and durable -- time will tell. Overall, I highly recommend this item as a good purchase. BEAUTIFUL ROCKER, WENT TOGETHER IN A FLASH, NO PROBLEMS WHAT SO EVER! I was very surprised with the weight of the chairs. They seem very durable. Like others have mentioned, the rubber bottom is a nice touch. In terms of the assembly, I would change the steps and go 1, 3, 2. If you put the back on before the spacer bars it's much easier. Also do not tighten anything until you have all the bolts in place. The first chair took me 30 min to assemble following the instructions and tightening bolts as I went along. The second chair took ten mintes going steps 1,3, 2 and waiting until the end to tighten the bolts. We bought four....a little afraid because some of the reviews said they were hard to put together, but we had no problem.....just screwed them together by hand until we saw that everything fit, then tightened down with tools. The are even better- looking than in the photo! Wish I had the whole art. Love it. I think it is comfortable. Even without cushion but it is a beautiful chair. I ordered this rocker along with the side table and porch swing. I love them! Totally upgraded the curb appeal of my home. Rocker was very easy to put together. I added a cushion and pillow for more comfort. This is a beautiful chair and was not hard to assemble. It is a light weight rocker that is easy to move. Looks just like photo on website. I really like this rocker. It is sturdy and looks great, you have to get used to the bar on the bottom. I've only just gotten them but they were easy to put together and very comfortable. So far so good. This item is very durable and looks & feel great while rocking. Would definitely recommend this product. Will be buying two more before the summer. Classy chair with or without a cushion. I've enjoyed this one for years and so far none of my admiring relatives have captured it. Easy to put together and stronger than it looks in the pictures.Hope it wears good. Looked for a long time to find a rocker that has a vintage look, yet beautiful and durable, for our huge covered front porch! These are gorgeous and I love the bronze metal! Love the chair. It’s a beautiful iron chair. Very nice! Sturdy and withstand any weather! I love this rocker ! !not only is it beautiful but it’s also so comfortable ...heavyweight n very wide making it delightful to sat in and watch a sunset.. I’m so pleased with this rocker I’m ordering another one!! "What are the dimensions of the seat of the rocker?" The seat dimensions are 21 inches x 20 inches. "Can you recommend a cushion for this rocker? What should the size of the cushion be?" I attached a list below to all the ones that will work: SKU # 15337878,15337877,15337876, 15337875, 15337874,15337873,15337872. I hope it helps. "Does this rock big not little half way rocks I bought one and it was expensive and back motion is nothing I want a big swing rocking motion does this one have that?" I like the looks of it. It will really stand out on my front porch. We are big people and I wanted a nice sturdy place to sit and enjoy my patio, and durable enough to stay outside year round. Very cool looking too. "I found cushions for the bottom but what cushions would you recommend for the back?" Hello farmerjoey,The dimensions of the backrest are 21 inches wide by 23 1/5 inches high at the highest point. Have a great day! "We have a friend that weighs approx. 330 pounds. Can the chair support that weight?" Thank you for your interest in the Sun Ray Iron Rocker. This chair would not be recommended for more than 250 LBS. "How much personal weight can it handle?"